Been watching lots of Mary Poppins at Chez Wink. Seriously people, I flit, I float, I want to slit my throat. That’s awful isn’t it, but it’s so bad I am missing Yo Gabba Gabba. Sure, it was sweet at first, sort of Little House on the Prairie, squeaky clean, “My kids are singing along with Julie Andrews while your kids sit, eyes glazed before the golden bangs of Hanna Montana,” righteousness. Now? Well, now I fear that I may end up a bit like the jolly uncle, floating on the ceiling laughing at god knows what. So, as I sit gently rocking myself in the corner willing the dancing penguins to waddle off and take Mary and Burt with her, I’ll brandish the Delurking Flasher and ask you to show yourself. Let me know that I am not alone, that you are here. Anything to get me to stop singing…did you realize that I actually included a Sound of Music song? Know why? Because when they aren’t watching Mary Poppins, it’s the Sound of Music. Clearly they dig Julie, think I should try Victor Victoria? Today my sister is 30. No names, no teasing, just this— I love you, Abs. Happy Birthday! Alright, just for you. Your works are amazing. I love reading every new post. Thank you for sharing. Hope you enjoy. Thanks for your blog! I love your upbeat perspective and sense of humour. Hellooooo! You already knew I was here I think but just in case, now you know. Hi – I'm a lurker! I have been reading and enjoying your posts for several months now, but lack of time has kept me from commenting. You have such a wonderfully engaging writing style, and I love the sweet family moments you share with us. what if i am a regular and you already know about me? does this still count as delurking or just stopping in to say hello? After months of lurking, hello! i love reading your stories, perhaps because i'm living a life led by toddlerhood as well…though i only have one child so far. Thanks for being something i look forward to during naptime! Hey there! Another great post my dear! Get them hooked on those classic musicals early! Try Annie, or Fiddler on the Roof too! OK, I still consider myself a lurker here, because I've only commented once…on the post about your Uncle Dennis. But I love checking your site and hearing what you have to say about life. You're one of my favorites! 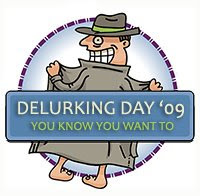 Have a great de-lurking day! Not a lurker. Breath … mellow … It will be okay. Try Raffi in concert. My daughter and I STILL watch that sometimes, she took the DVD to college with her. Okay, I am delurking as you requested 😉 I found your blog somehow through the blog world, don't remember at the moment. I have been reading for over a year now. I have a four month old and enjoy the stories of the fun times to come with my little one. Have a great rest of the evening! At my house when Shortman was young, it was Willie Wonka and the Chocolate Factory. Or The Wizard of Oz. He memorized all of the Lollipop Guild song AND all of the Oompa Loompa songs. They grow out of it. Oh, and sorry, I don't count as a delurker, do I? WOW! Look at all your lurkers!! I'm so jealous :0 Seriously though, I can't even imagine ever missing Yo Gabba Gabba!!! Too funny! Wish my boys had an ounce of interest in Julie 🙁 My 6 yr old JUST discovered Star Wars movies this past weekend….Julie is much easier on the eyes than Jabba the Hut (sp?)!!! Be thankful!! I don't notice anything different in the frozen milk, however I'm not a milk drinker. I do tend to shake it before I pour it, not sure if it makes a difference. My kids are only 2.5 and they only know frozen and defrosted milk. I guess my suggestion would be that before you buy gallons and gallons, I'd do a test. I also found that some of the cheaper brands use containers that do not hold up to the expansion of the freezer as well as others. CostCo seems to be okay, but I have had some explode on me. The paper cartons seem to hold up best. We go through a lot of milk, but not as much as you! I suppose it is coming when the boys get a little bigger! I don't think we watch Mary Poppins nearly enough around here. We're all watching Teenage Mutant Ninja Turtles or Polly Pocket or Scooby Doo…or Ice Road Truckers. That trailer is hilarious though. I'm de-lurking to say hi! I'm a long-time reader. I only comment occasionally, but I love reading your posts! My personal hell is, "The Wizard of Oz"… over and over again… the girl just loves it. "I flit, I float, I want to slit my throat"… that was AWESOME!!! Made me giggle. I know as a child I tortured my parents for months by begging them to play the "Annie" soundtrack over and over. So much so that driving distances became known in our family as so many "Annies" away. As in, "we'll have to play this @#$@# soundtrack 5 times before we get there!" Oh, and I once staged the ENTIRE production of "Cats" in a neighbour's backyard. Good times. I can't believe I missed delurking day. I love delurking day. I dont' know…. taking a vacation sure does hinder my blog writing and reading. And … I am totally anxious about missing my tv shows. Hiya! Oh poor Mary P. Feed the burds…I hate that part with all the creepy birds. Hope they've moved on to something new by now. and that movie is the longest movie Disney ever made. The only movie longer is the Sound of Music which we watched for the fortieth time last Friday. I often lurk. Only because I read on Google-reader. Bad habit! Well, I'm not technically a lurker, but I do read in Google Reader far more often than I click through to comment. Just wanted to let you know. I looked through your website http://toddlywinks.blogspot.com/ and it attracted my attention by the varieties of useful and interesting information. I have good credit card websites where everybody can find useful information about finance and money especially now at the time of financial downturn. They contain much useful information for the readers. There's a fine set of articles that reveal all pros and cons of credit cards, give tips how to reduce credit card debt and establish good credit. If it agrees with your policy, I would like to place some links in your fresh post on your site. Please, let me know if you are willing to work with me and what are the rates you offer. If you are interested in it I will send you some more details about my websites. Well I guess you should go searching for a few more Julie Andrews movies, or you could try a nice pair of ear plugs. It is amazing how many times I have seen Cars and chitty chitty bang bang. I'm not necessarily a lurker, but I don't get over here as often as I'd like. Life is like that. It's always a pleasure to catch up, to wave hello as we pass in the halls of cyberspace. It's good to see you again . . .
You should give Bed knobs and Broomsticks a whirl. That's a classic. It could be worse than Mary Poppins though, think Chitty Chitty Bang Bang! Nice post.